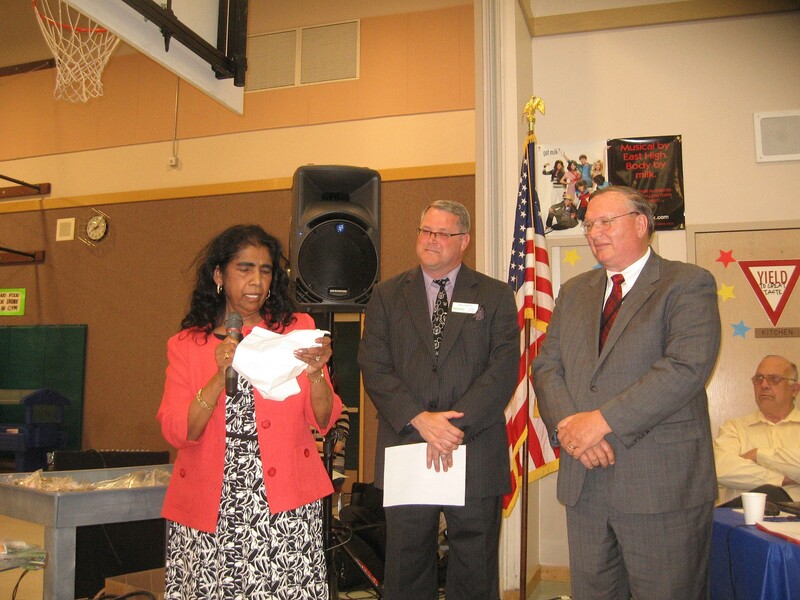 Nearly fifty staff members from the Bethel and Eatonville School Districts are retiring this year, and some claim it is due to fears that pensions will be cut by the Washington state legislature in the near future. 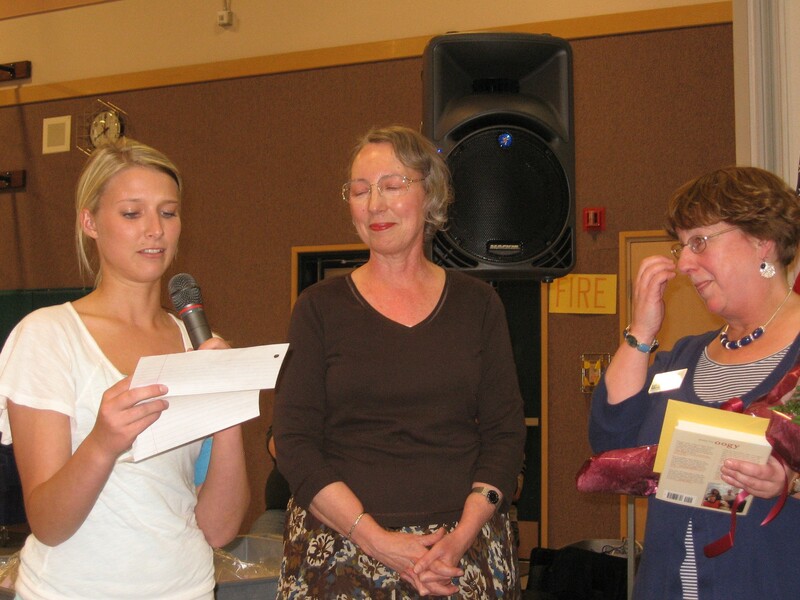 Seven teachers from Eatonville have announced their retirement, and twenty-one educators are leaving Bethel. In addition, Bethel is losing numerous support staff and at least one principal. 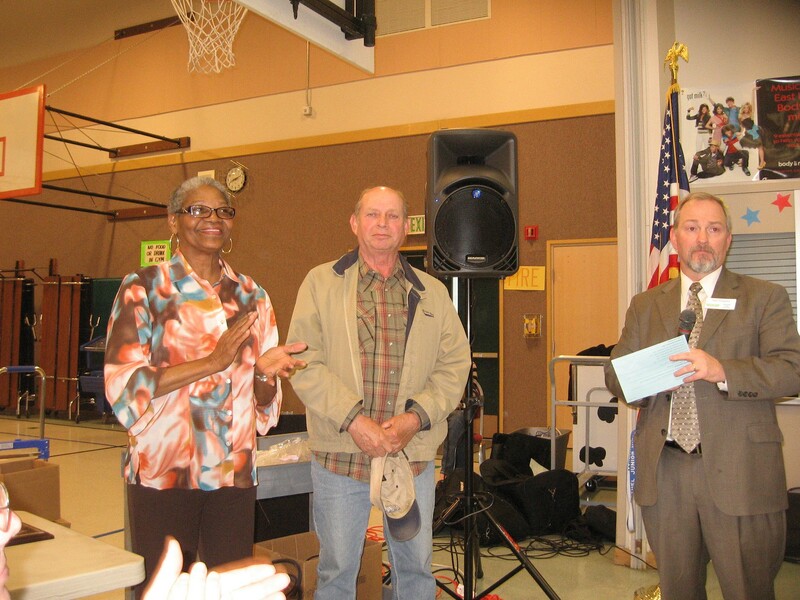 The contributions of many of these retirees were honored at a Recognition Ceremony at Pioneer Valley Elementary School during the Bethel School Board meeting on June 14. 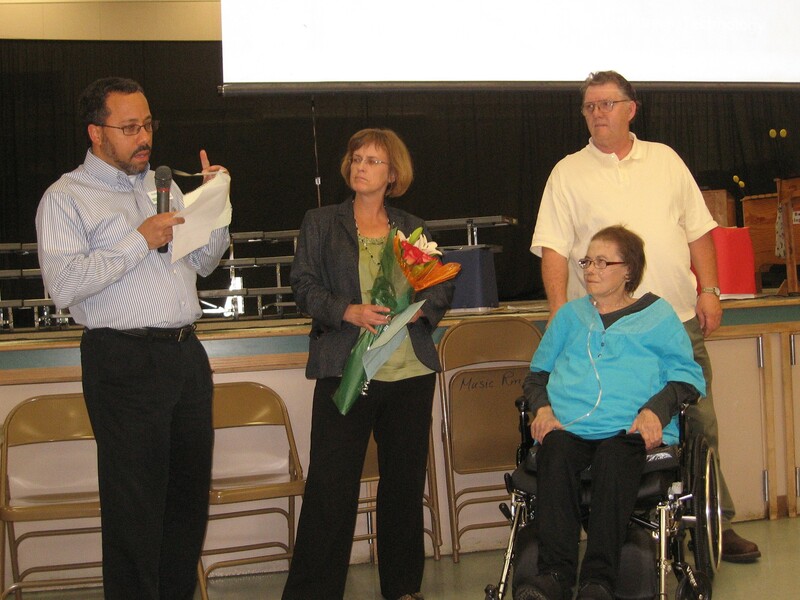 Retiree Judy Miller, sitting, was honored by her principal at Pioneer Valley Elementary, Steven Rushing, along with two-dozen other educators and staff. As each teacher strode to the dais accompanied by their current principal, it was clear that the Bethel community was losing more than just 800-plus years of experience, but also a large cadre of mature and confident educators who have made a powerful contribution to their students and colleagues. Despite the dark cloud of pension reductions, most retirees voiced a desire to have more time with their grandchildren and to be free from grueling work schedules in order to travel. Similarly, Lucy Fountain, the Eatonville School District’s Director of Curriculum and retiring after 41-years, told the Mountain News that she planned to take her family and trace their ancestral roots, heading back first to Iowa and Minnesota to explore the farming life of her great-grandparents, and then head to their origins in Vosa, Sweden. However, some educators voiced strong concerns about pensions, worried that they may be significantly reduced in the years to come. Pat Roberts-Dempsey, a 42-year veteran of Bethel classrooms, told the Mountain News that she was retiring because she feared the state could reduce her pension in the future by as much as $10,000 per year. “It’s definitely time to go,” she said. Roberts-Dempsey said that due to the woeful condition of the state budget, legislators are considering several plans to reduce pension expenditures. Mostly notably would be an accounting shift whereby pensions would be paid on the basic state salary schedule and not on the actual salaries earned by an individual teacher. As state budgets have floundered over the past few years, teachers are increasingly paid from district levies, such as the TRI monies paid for out-of-classroom duties such as parent conferences or lesson planning. In addition, many teachers earn additional income by coaching or performing other after-school duties, such as working with at-risk kids. These kinds of “supplemental” incomes would be excluded from future pension consideration if cost-cutting legislators have their way, Roberts-Dempsey said. Currently, teacher pensions are paid at 60% of the average of a person’s best two years of earnings. 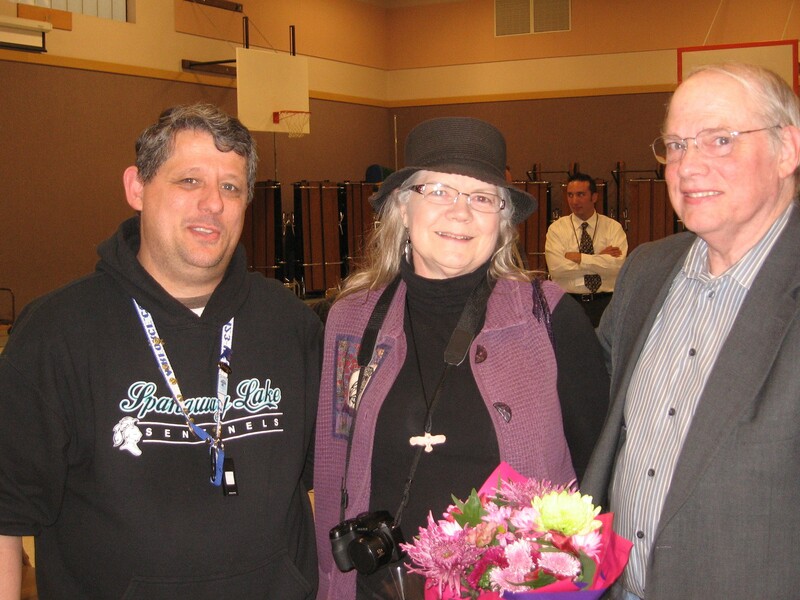 Veterans of Bethel Junior High Carolyn McNeal, (l), and Bruce Adler, (c), were praised by their principal Paul Remfer, (r), who said it takes a very, very special person to teach junior high students and like it. However, teachers are already seeing an impact to their current salaries, and ultimately, their pensions. Cruver said that all teachers are facing a 1.9% salary reduction starting in September, which will have a ripple effect on their pensions. In addition, the state has also cut funding for LID days, which are paid teacher training sessions. Combined these costs are reducing the average pay of a Bethel teacher by about $2,500. The average Bethel teacher earns about $60,000 per year, and has 14 years experience and a master’s degree. Beyond these cuts, there are more serious and more fundamental concerns facing teacher pensions, and that is the issue of the state’s non-payment of matching contributions into the pension fund account. 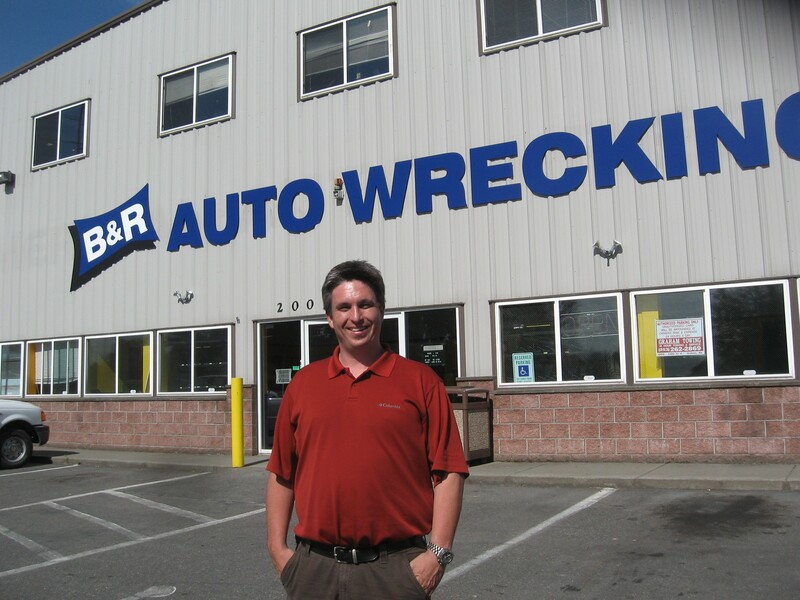 Cruver described a situation whereby individual teachers pay hefty monthly contributions – his is $500 per month – but the state is supposed to match those monies to insure the long-term viability of the plan so that retirees always receive their pension check, even if their share of contributed funds is used up. Cruver said that dating back to the late 1990s the state failed to contribute their full share to the state pension fund account because the assets had been invested in the stock market in mutual funds and seemed to be doing well for so many years. “The state would tell us – ‘Don’t worry, the money will be there.’ – as they decided they didn’t need to pay their share,” Cruver said. As a result, the financial viability of the pension fund is now uncertain. “I’m banking on the state to live up to its commitment and not to play games with us,” said Cruver. Acknowledging these kinds of threats to teachers’ welfare, Ms. Roberts-Dempsey, a four-term union president for the Bethel teachers, said that one of her tasks in retirement will be to lobby in Olympia on behalf of teachers. “I may be retiring, but I’m not going away,” she said with a twinkle in her eye. Thirty-five year veteran of Shining Mountain Elementary, Marcia Nanea is honored by one of her former students, Kylie Alexander, who praised her for her inspiring "individualism." Looking on is principal Mary Seawright (r). This entry was posted in Bethel News, Culture, Eatonville News, Politics. Bookmark the permalink. This retirement and pension subject is a sore one. We have people who have been teachers for 40 or more years, who have faithfully paid into the system; expecting to have the promise fulfilled that their pensions would be there when they retired. So, these people have lived on less money throughout their careers to put away some for the future. Now, state’s are saying pensions are to be cut! What happened to all the money these people put in to their pensions (And this same thing holds true for Social Security)? Is it ok to just let this go? Is it ok to have had all that money just disappear? It was basically stolen from people’s standard of living! Why is it that suddenly the whole country has to “cut” benefits to the citizens and CEO’s are still making millions? Why is it that the rich are getting richer but the members of the middle class are being asked to tolerate “austerity” measures?